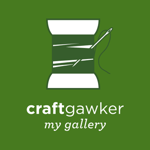 ← Make: Book Binding Tutorial! Before we start, we just wanted to say that we are both sending lots of thoughts and prayers to all our readers and their friends, family and loved ones who are currently without power, flooded or snowed in following Hurricane Sandy. We know a lot of our readers live in the areas affected by the storm. We have been following the news since Sunday and thinking about you all. Please keep staying safe and looking after each other. Phil and I have only really discovered roasted pumpkin seeds this fall. 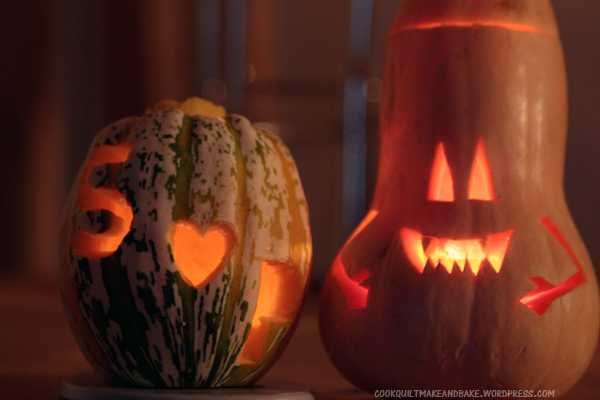 We can’t believe all this time we have been eating and carving pumpkin and just throwing them in the trash! But we are total converts and now we can’t get enough of toasting them and trying out new sweet and savory flavor combos. We even tested some on Phil’s family who were around over the weekend and they were a hit! So, tonight we thought we would share out latest flavor combo’s which also just so happens to be our favorite so far: Mocha! They go perfectly in a naughty chocolaty trail mix as they add just the right amount of coffee crunchy goodness. So, here is the recipe! Its super quick! 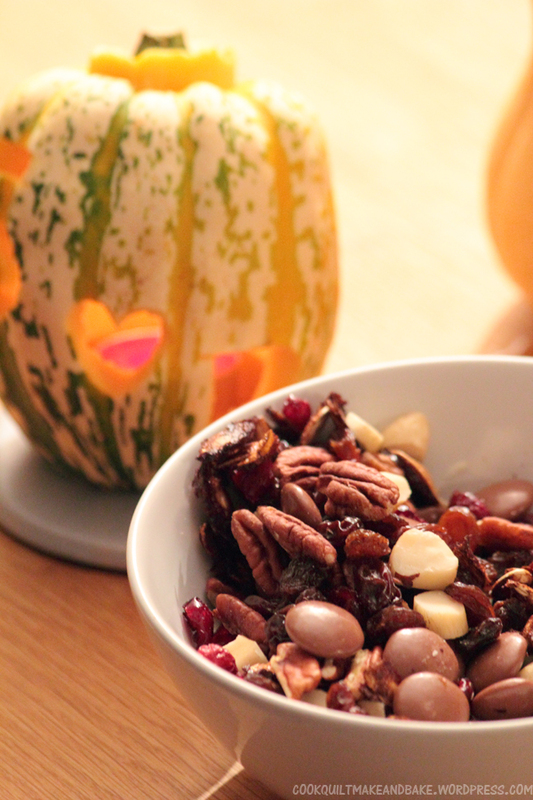 Seriously ….. by the time your pumpkins are carved your snack is ready to go. 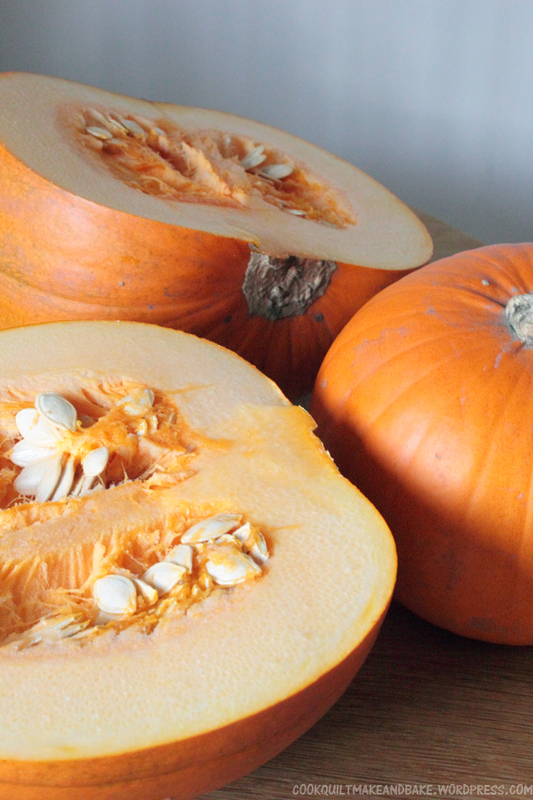 1) Scoop – first of all, chop your pumpkin and scoop out all the seeds and pulp, then separate the seeds from the pulp. 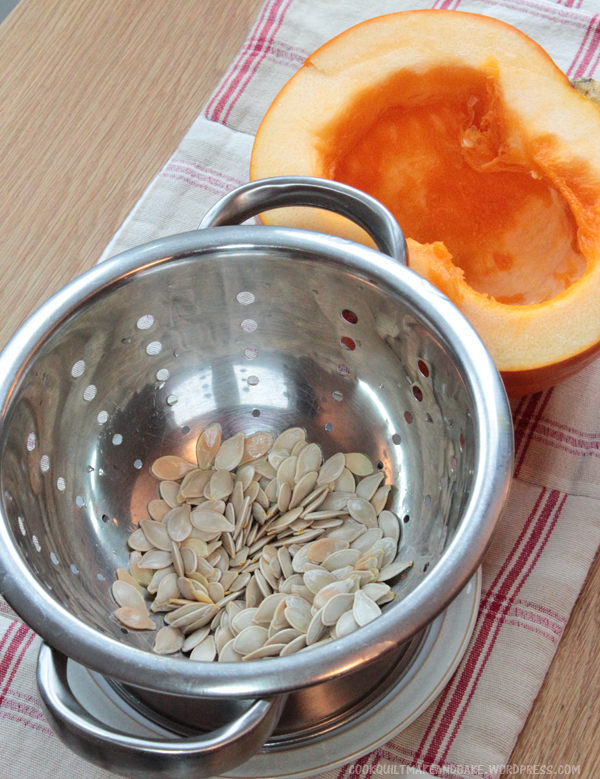 2) Wash – next give your seeds a quick rinse to remove any remaining bits of pulp ….. hint: pumpkin seeds float, so when you wash them, pop them in a colander and then don’t run the water too fast otherwise they all float off and down the drain (I learned that lesson the hard way). 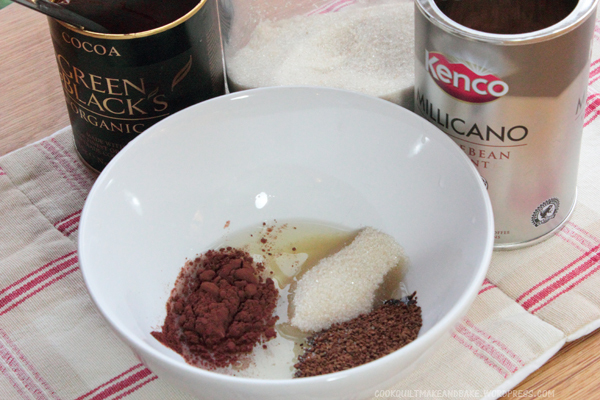 3) Whisk – In a separate bowl whisk together your egg white, sugar, coffee and cocoa powder into a thick wet mix. 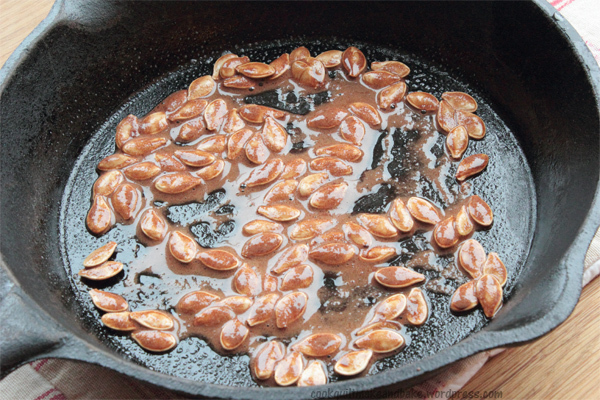 4) Toss and Spread – Toss your pumpkin seeds in the mix so that they all get a thick coating of the egg mixture. Then spread them out on a baking sheet or in a cast iron pan which you have lightly greased (we just Pam sprayed ours which works really well). 5) Bake – Pop the seeds in a 150 °C (300 F) oven for 35 – 45 minutes, taking them out to lightly toss them half way through the cooking time. 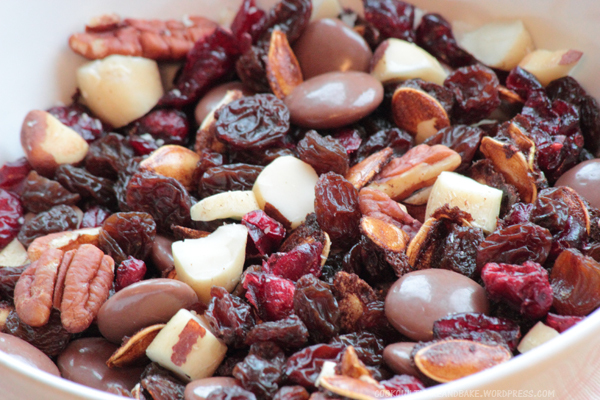 6) Mix – Chop the nuts for your trail mix if your using them, and weight out your other trail mix ingredients, and then simply toss them together with the pumpkin seeds. Happy Halloween to all of you! We decided to properly celebrate our anniversary over the weekend. This year is Phil’s pick so we are off to see Skyfall (I have to admit, I’m actually pretty excited myself!) We’ll let you know what we think. Hi, I'm Sam, he's Phil. Welcome to our blog where we share our fun down time projects. We're just a young couple, happily cooking, making, quilting and baking our way through life and love. You're welcome to stop by and share the good times! This entry was posted in Cook and tagged chocolate, coffee, halloween, mocha, pumpkin, raisin, recipes, seeds, snacks, trail mix. Bookmark the permalink. Brilliant as always, although Phils squash looks more cheerful than scary!